Of the many highlights, one event that does pique the interest is the intriguing meeting of pianist Kate Williams' Four Plus Three with Georgia , featuring newly arranged and composed music especially for the festival. It was with great pleasure that Jazz Views had the opportunity to interview the ladies in the lead up to this eagerly awaited series of concerts at the Pizza Express in Soho. It has been 3 years since your ReVoice! festival. Why now to embark on a new festival? Georgia: Since pressing pause on ReVoice! I’ve largely concentrated on my work with double Grammy-winning pianist and composer Alan Broadbent. We released our first album of co-written originals, Songbook, in April and played some fantastic dates including a debut headline at Ronnie Scott’s. Knowing it was going to be an important year I also wanted to mark the second half of it and keep stretching myself. I learnt so much performing nightly in different duos during the 5 years of ReVoice! and wanted to extend that into full bands and bigger collaborations. Can you tell us more about your new festival, and the meaning behind the title Hang? The Festival will be 6 shows over 4 nights including one double bill and I’m singing in them all! Hang is both the assembly and installation of artwork before an exhibition and also the after show, after hours gathering. I wanted to describe both the work and the fun especially as all the projects are fully collaborative. How did you go about arranging a programme and choosing the musicians to perform? Georgia: I decided to programme a combination of old and new projects so there would always be an authentic thread but also the frisson of challenge. Revisiting my longstanding Trio with stellar guitarist Nigel Price and Julie Walkington was a must. Then Quadro (with Frank Harrison and Andrew Cleyndert) is a fledgling group that started just last Spring and intrigues me more and more each time we play. I liked the idea of putting two very different trios together. I’ve long been a fan of Brazilian music and the sextet co-led with Mark Crooks is a joyous tribute to one of the world’s greatest composers - Antonio Carlos Jobim. Compañeros is the newest project and thanks to bassist Arnie Somogyi who thought I’d be a good musical match for singer/guitarist Guillermo Rozenthuler. Indeed we immediately struck a great rapport and camaraderie (hence the name) and together with percussionist Dave Ohm explore a wide-ranging Latin American repertoire. I embrace any opportunity to work with the magical Ian Shaw who never fails to move me with his peerless emotional depth. Similarly Liane Carroll: last year we stepped in to cover a gig at very short notice in a show with our music and life partners - Roger Carey and Dave Ohm. Mr & Mrs was a truly spirited and spiritual musical experience and we are all thrilled to revisit it. Finally Finding Home with pianist/composer Kate Williams’ trio and string quartet. Kate had asked me to co-write some material for this outfit last year and as we developed the work I thought Hang would be the perfect showcase for its premiere. The entire festival is being held at the Pizza Express in Soho, do you feel this is an advantage being able to hold all the concerts in the same venue? Georgia: For sure and especially because the Pizza always feels like coming home. I’ve seen so many gigs there and particularly after 5 long seasons of ReVoice! (mainly hosted there) I really understand the acoustics and the rhythm of the room. I’m also hoping maybe they’ll revive my own named cocktail - the Italian Caipirinha! One of the most intriguing concerts of the festival is the collaboration between Four Plus Three and the concept Finding Home. Can you tell us how the idea originated? Georgia: I was already a fan of Four Plus Three - both the album and live gigs I’ve seen have been sublime and such a beautiful blend of genre and musicians. The brilliant Gareth Lockrane and Mike Outram and most recently Kate’s dad, classical guitarist John Williams, had previously guested so I was very honoured when she asked me to join the illustrious list. We seemed to gravitate towards the concept - probably a reflection of the worrying times we find ourselves in, the sense of disconnection we are seeing both locally and globally. Kate: I think we both share the same feelings about the strange times in which we live, and after Georgia had volunteered in the Calais refugee camp, the idea of Finding Home seemed very relevant. How do you go about adding the additional voice to the established Four Plus Three ensemble? Many would say it is difficult enough to write for piano trio and string quartet, never mind bringing an another voice to the group? Georgia: One of the (many) things I admire about Kate is exactly that ability to blend voices together. Her projects are consistently inventive, honest and forward-thinking. We settled on the concept early on which I think galvanised us both then wrote sometimes lyrics first, sometimes music first and a mix of the two. It’s been a joy working together: Kate embraced every idea and has scored some stunning, deep music. Kate: I often write and arrange not only with the sounds of each instrument in mind, but with the sounds of specific players. I played cello (rather badly!) as a child, and that has definitely helped in my arranging for strings. In terms of adding voice, when I started Four Plus Three, I always had in mind that we could augment the line-up and collaborate with other instruments. With Georgia, it has been easy - her voice has such a beautiful clarity and warmth that I had a strong picture in my mind right from the start as to how it would work with strings. That's not to say that everything about arranging and composing is easy - there are always tunes, or parts of tunes, that one struggles with, but I'd say that is more to do with the composition process in general rather than anything specific to this line-up. We have worked together in quite a flexible way for Finding Home, each of us sending the other little snippets of tunes, words and ideas. When there is plenty of mutual respect and trust, it allows each person to try things, and then sometimes to change them - it makes the whole thing more organic. I don't tend to make suggestions for lyrics, but on the few occasions when I've had an idea for the words of a tune - maybe a particular mood or sentiment - Georgia has a knack of totally hitting the nail on the head! How did you go about choosing the repertoire to sit alongside the original compositions? Georgia: Well actually there are now only 2 standards - an incredibly evocative reworking of I Cover The Waterfront and a heartwarming Chega de Saudade. Then there are a couple of originals with Alan Broadbent (including one not yet recorded) which fit the concept perfectly and seemed an obvious bridge. Finding Home is such an interesting project, do you have plans to take the music out to any other venues around the country? Kate: Yes we're very keen to develop this project, and to keep adding new repertoire. Because there are 8 musicians, it will take some organising, but that won't stop us! We are playing at Watermill Jazz in Dorking on 10th October, and are now making plans for 2018. Georgia: Thematically it’s a project very close to my heart and is very much of our times. As Kate mentioned, two years ago I started volunteering at the unofficial refugee camp in Calais known as the Jungle and have continued to try to raise funds and awareness since its closure. I’m so grateful that Kate that Finding Home has allowed me to relay some of the stories that were told to me or witnessed there and to be able to do that from the beauty, dignity and honesty of this music. You have collaborated together in the past, how did you meet and begin making music together? And can we expect a recording anytime soon? Georgia: We met through mutual friends about 17 years ago. One of my earliest memories is falling asleep on Kate’s sofa one New Year’s Eve/Day after watching too many episodes of The League of Gentlemen! Over the years we’ve followed each other’s careers and played together. In 2010 I wrote a lyric to a tune of Kate’s that had mesmerised me, 'Silhouette', which then became the title (and closing) track of my third album. When I was preparing to record Songbook, Kate workshopped all the songs with me before I was ever able to play them with Alan due to the geographical logistics of living on different continents! I’ve loved collaborating with her and we definitely hope to record Finding Home at some stage. Kate: We met about 17 years ago through mutual musician friends on the scene. We always got on very well musically and as friends. Then in 2008, I released a quintet album of mostly original tunes. Georgia asked if she could write lyrics to one of the pieces 'Silhouette'. I was both flattered and surprised! 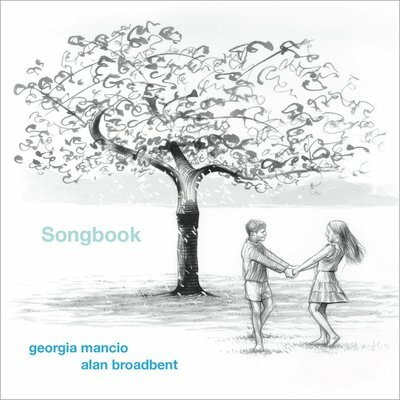 More recently, Georgia's stunning Songbook album with Alan Broadbent demonstrates perfectly her ability to write (and sing!) the most heartfelt lyrics without ever sounding corny or cheesy - there's a real honesty and integrity to her approach.To ask Georgia to collaborate with Four Plus Three really seemed like such a natural progression for me. It was also an opportunity to write some songs together from scratch - a process which has been very enriching. I'm just so glad she agreed to it! If the whole process of organising and performing at the festival does not leave you totally drained, have you plans to make it an annual event? Georgia: I guess everything finds its natural rhythm but I hope that Hang is a keeper because it definitely feels like the start of something special and I have a lot of ideas already buzzing for a second (and third) edition…. For more information visit georgiamancio.com & kate-williams-quartet.com.